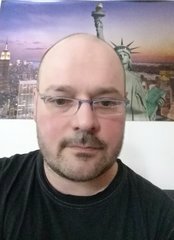 Hello all, initially I had no problems with my UM3E. After about a month I started having issues with the too solid layers I attributed to active leveling. After disabling this and leveling my bed manually, the problem continued. 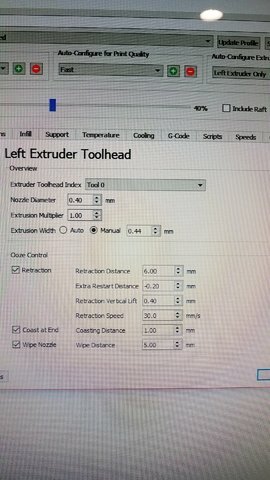 I've changed print cores, materials, temps and extrusion multiplier to no avail. Below is the latest example of the final layers. Typically, they are slightly better, but never complete. I'm at a loss and seek the help of the UM gods. I think active alignment only matters for the very first layer, and in the second layer, a material flow balance already begins. After that, all lines should be connected to each other and form a completely closed surface. 1. You may print too few top layers. 2. The flow of material is constantly too low, because the lines are not connected to each other ... Check if it is already like this before the top layers. 3. The printing temperature may be too low. 4. There may be problems with a contaminated material feeder and or hot end and nozzle. 5. Generally problematic material is used. And is your filament PLA? For example you can print about 5 cubic mm/sec of PLA through a 0.4mm nozzle at 230C but not at 210C. To get cubic mm/sec multiple 3 things: line width, print speed, layer height. Same formula as volume of a box. Thanks for the reply! I usually use 4-5 top layers which is plenty and worked when I originally started using the printer. I changed print cores to a new one to address that angle. I've had the same result with 3 brands of PLA. Printed between 200C and 220C. Thanks for your reply as well. 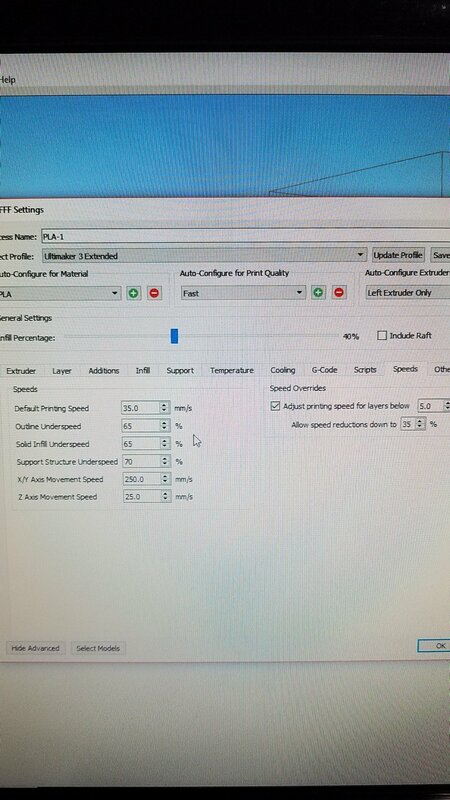 I have attached images of my S3D settings and in addition, I have tried temps between 200 and 220C with up to 115% extrusion and the same result. It's not any better with Cura or using 90% infill. I've not seen anything like it with any other printer I have. It's definitely under-extrusion, as gr5 says. You have checked a lot, but it still lacks the complete material transport I think ... So feeder, Bowden and the connection to the extruder must also be checked carefully. You should be able to do that no problem. Well there's lots of other possibilities. Here's a list below. You can ignore #1 and #18. #14 and #16 are the first 2 things I would check for as it takes all of a few seconds to know if you've every printed glass fill, carbon fill or glowfill. And the middle fan comes on when a core gets above 50C - trivial to check. Next I would try a cold pull. Also known as atomic pull. There are instructions on the UM3 in the menu system - it guides you through the process. 2) Line Width larger than nozzle. 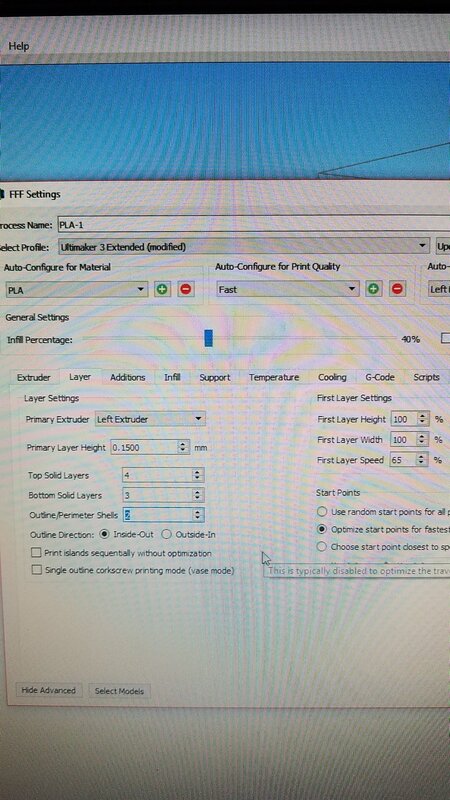 In cura 3.X search in settings for all line widths. If any of them are larger than the nozzle diameter this can cause underextrusion. There are 8 of these in cura 3.2.1. 3) Curved filament at end of spool - if you are past half way on spool, try a fresh spool as a test. 4) curved angle feeding into feeder - put the filament on the floor -makes a MASSIVE difference. 5) Bad core. Try a different core. It could be clogged, or something more complex like the temp sensor in the core. 5a) clogged nozzle - the number one most suspected problem of course. Sometimes a grain of sand gets in there but that's more obvious (it just won't print). Atomic method (cold pull) is the cure - from the menu do a few cold pulls. The result should be filament that is the exact shape of the interior of the nozzle including the tiny passage to the tip of the nozzle. If it doesn't look like that you need to pull at a colder temperature. You can do it manually instead of through the menu if it's not working right but learn through the menu initially. 95C is roughly the correct "cold" temperature for PLA. 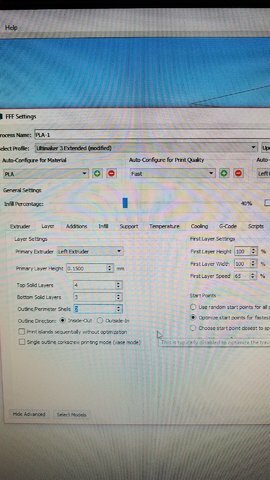 Higher temps for other filaments. 6) feeder spring issues - too tight, too loose. You want the tension such that you can clearly see the diamond pattern biting into the filament. You want to see at least 2 columns of diamonds. 4 columns is too much. You usually want the tension in the center. 7) Other feeder issues, one of the nuts holding UM2 and UM3 together often interferes with the feeder motor tilting it enough so that it still works but not very well. Other things that tilt the feeder motor, sleeve misaligned so it doesn't get a good grip. Gunk clogging the mechanism in there. 8b) Something wedged in with the filament. 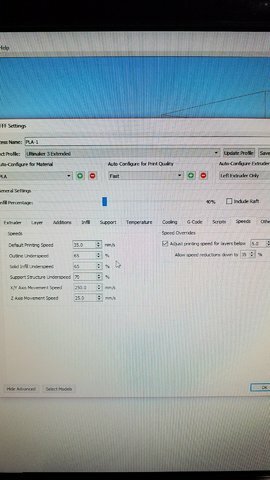 I was setting up 5 printers at once and ran filament change on all of them. One was slowly moving the filament through the tube and was almost to the head when I pushed the button and it sped up and ground the filament badly. I didn't think it was a problem and went ahead and printed something but there was a ground up spot followed by a flap of filament that got jammed in the bowden tube. Having the wedgebot (link below) helps you feel this with your hand by sliding the filament through the bowden a bit to see if it is stuck. 9) Extruder mis calibrated. Maybe you changed equipment or a wire fell off. Try commanding the filament to move exactly 100mm and then measureing with a ruler that it moved 100mm within 10% accuracy. If not adjust the steps/mm (this is done by editing a json file on the UM3). 10) Z axis steps/mm. it's easier than you might think to double or half the Z axis movement as there is a jumper on the circuit board that can be added or removed. If the Z axis is moving 2X you will get 50% underextrusion. Your parts will also be 2X as tall. 11) Crimped bowden. At least one person had an issue where the bowden was crimped a bit too much at the feeder end although the printer worked fine when new it eventually got worse and had underextrusion on random layers. it's easy to pull the bowden out of the feeder end and examine it. Similar to 8b above - use the wedgebot to feel how much friction there is in the bowden. 12) Worn Bowden. After a lot of printing (or a little printing with abrasive filaments) the bowden resistance can be significant. 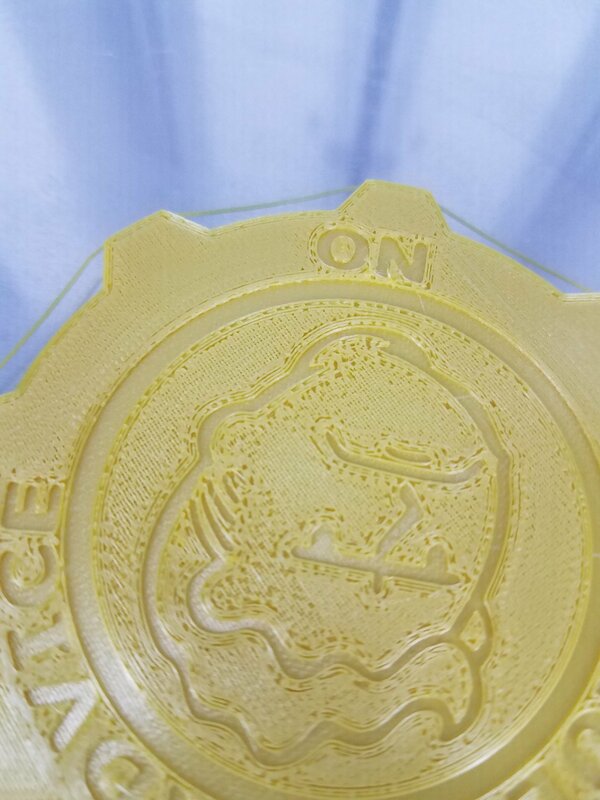 It's easy to test by removing it completely from the machine and inserting some filament through it while one person holds it in the U shape. Preferably insert filament that has the pattern from the feeder and fight the movement by applying 2kg force on both ends at the same time and then seeing how much harder you have to push it on top of 1kg force. UM2 feeders can push with 5kg force. UM3 can push quite a bit more. 5kg is plenty. 13) Small nozzle. Rumor has it some of the .4mm nozzles are closer to .35mm. Not sure if this is actually true. I'm a bit skeptical but try a .6mm nozzle maybe. This shouldn't be a problem on the UM3 which has very good quality control but try a different core. 14) CF filament. The knurled sleeve in the extruder can get ground down smooth - particularly from carbon fill. 4 spools of CF will destroy not just nozzles but the knurled sleeve also. Look at it visually where the filament touches the "pyramids". Make sure the pyramids are sharp. 15) Hot feeder driver. I've seen a more recent problem in the forums (>=2015) where people's stepper drivers get too hot - this is mostly a problem with the Z axis but also with the feeder. The high temps means the driver appears to shut down for a well under a second - there is a temp sensor built into the driver chip. The solution from Ultimaker for the um2 is that they lowered all the currents to their stepper drivers in the newer firmware. Another solution is to remove the cover and use desk fan to get a tiny bit of air movement under there. This doesn't seem to be a problem on UM3 even though it's the exact same circuitry but they lowered the current in the firmware. But it's worth considering if air temp is 30C or hotter. It would probably happen only after printing for a while (air heats up slowly under the printer). 16) third fan broken. This tends to cause complete non-extrusion part way through a print. In the door of the head. You can hear it come on when cores get above 40C. Without this fan several things can go wrong. It can take a while as usually you also need several retractions to carry the heat upwards. There are a few failure mechanisms and I don't understand them all. One of them is probably that the molten PLA spreads out above the teflon and sticks to the metal in a core or fills the gap at the base of the bowden in UM2. Later it cools enough to keep the filament from moving up or down. 17) Spiralize/vase mode. This is a rarely used feature of Cura but you might have left it on by accident? In this mode the wall of your part is printed in a single pass. So if you have a .4mm core and the wall is .8mm thick it will try to over extrude by 2X. This is difficult to do and may instead lead to underextrusion. 18) too many retractions (this causes complete failure) - if you have too many retractions on the same piece of filament you can grind it to dust. 10 is usually safe. 20 is in the danger zone. 50 should guarantee failure. You can tell cura to limit retractions to 10 per a given spot of filament. Do this by setting "maximum retration count" to 10 and "minimum extrusion distance" to your retraction distance (4.5mm for UM2 and 6.5 for UM3). Well I don't know S3D very well so I'd definitely also try using cura at least just for one print to see if it suddenly works just fine. This will eliminate a LOT of variables either if it works fine or also underextrudes. Thanks for the very detailed reply! I realized I've not yet checked the knurled/hobbed gear for filament clogging. I assumed since the filament had bites in it, that it wasn't needed. -To answer your question about extrusion width, I just apply the general rule that you can go between 90-120% nozzle diameter as with other printers. -Maybe I was over confident it the print core's melting efficiency. I'm used to an E3D hotend keeping up with .48 width by 1.5 height layers at 35mm/s @215C on the Robo I had. I have much adapting to do. No this is nice and slow. 2.3mm^3/sec should be absolutely no problem. Something is wrong. Eliminate the slicer first since slicers are so damn complicated. After about half a day of tinkering, it ended up being a combination of things. *I lowered the bed about 1/8th of an inch, I didn't realize that being up too high can allow the cores to both touch and throw everything off. *Re-enabled active leveling and did a pre-print active level. *Took one turn off feeder tension. *Bumped flow from 1.00 to 1.01 (101%). Results were much better, not only on top layers, but mostly got rid of my random first layer dragging issue.